Your order must be made via our webshop. A confirmation of your order will be sent to specified email address (If you are not receiving the email from us, check your spam). When ordering from our product range, you must be at least 18 years old. According to international law, you have to be 18 years old to enter into purchase agreements. 1. VISA, VISA Electron, Master och Maestro card via PayPal, den pålitliga ledaren inom online-betalningar, gör att köpare och företag att skicka och ta emot pengar online. PayPal (www.paypal.com/se) har över 200 miljoner medlem konton i 190 länder och regioner. 2. Payson Sweden (www.payson.se) payment is possible with online banks Swedbank, Handelsbanken, SEB and Nordea. 3. 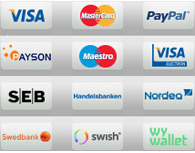 Swish Sweden (www.getswish.se) makes it easy to take payments using your mobile phone. If you will cancel yor order please immediately email us or contact via messenger. You will not be able to cancel order if we process your order or have already sent out, but you can return the parcel to us. Please note that you as a customer will be responsible for the return shipping. If for any reason you are not satisfied with your order you always have 14 day right of return. To take advantage of this, any product package musy be unopened and item must be unused. Please note that the right of withdrawal does not valid for used or opened cosmetic products (gel, acrylic, gel polish, nail polish, cosmetic liquids, oils and creams). The customer is also responsible for return shipping. Return policy not valid to gift cards. Contact us here before you return your package. We will help you! Do not hesitate to contact us by e-mail: info(at)nailshop.me or fill in the contact form and also via Facebook / Messenger. If you are not receiving the email from us, check your spam. All incoming messages about your orders can be found on this link: My Account (Login) ⇒ Order history and details ⇒ Select Order Reference.